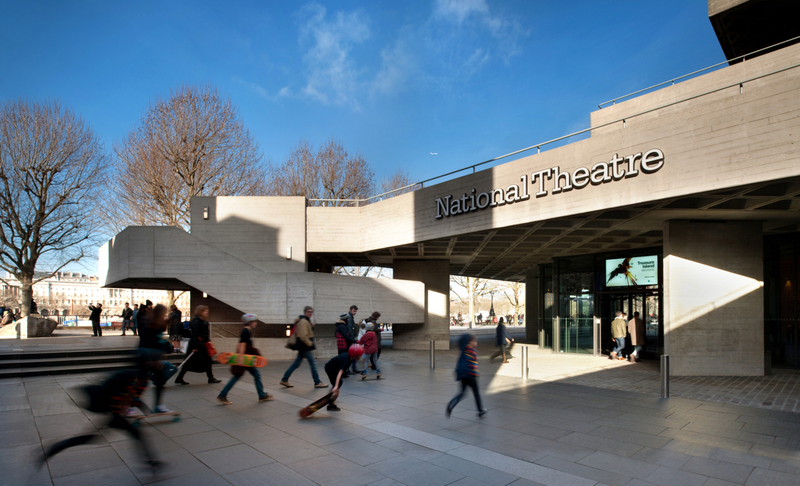 Promo: Talk by National Theatre Artistic Director Rufus Norris about Macbeth tour. – East Midlands Theatre. 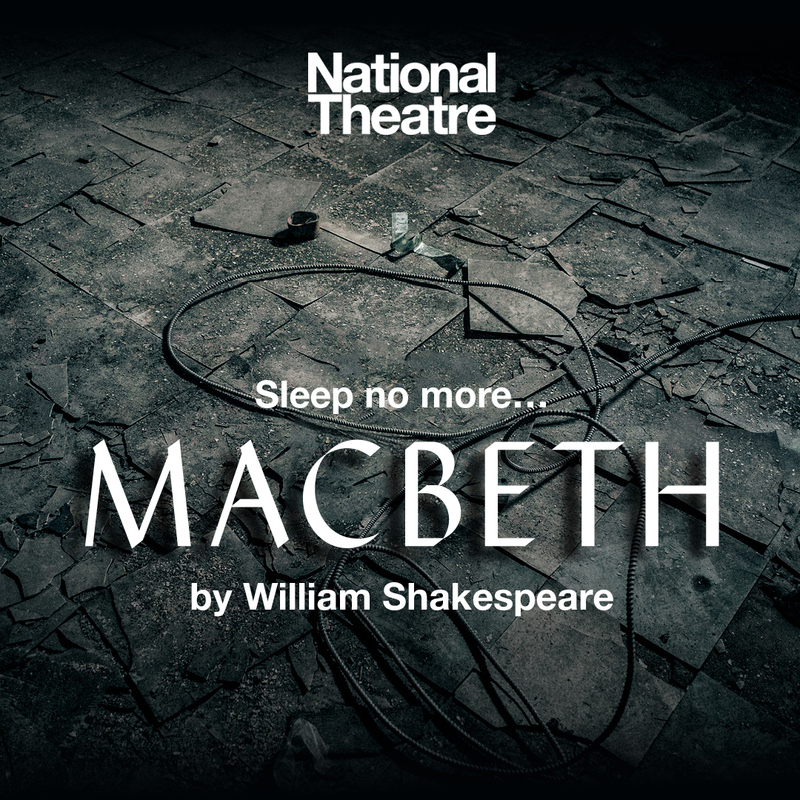 Promo: Talk by National Theatre Artistic Director Rufus Norris about Macbeth tour. 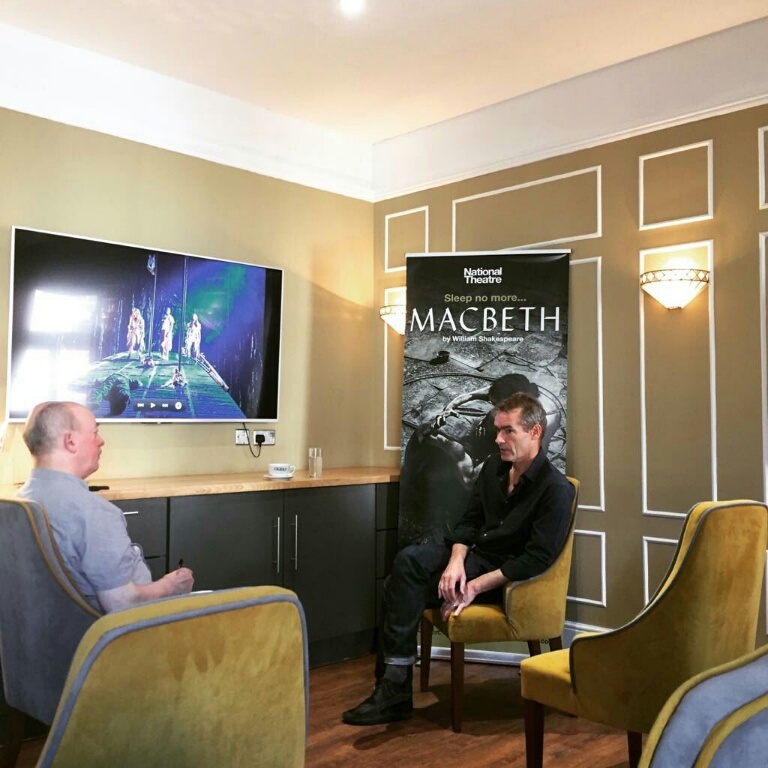 National Theatre Artistic Director Rufus Norris was talking to the press at the Grand Theatre Wolverhampton recently and East Midlands Theatre Phil Lowe interviewed him specifically about Lady Macbeth and during the Q&A posed questions about the nature of the Macbeth witches. This transcription will be further edited for Nottingham Post later this year to promote Macbeth at Nottingham Theatre Royal. RN: Whenever I am starting on a project there are a couple of questions which I try to answer; in terms of why and how I am doing a certain play like Macbeth. For the me the ‘why’ comes down to two aspects, the personal and the political or the socio-political. On a personal level it was a play that I studied when I was young and grew very attached to. I saw a very simple but dynamic production of it in Kidderminster where I went to college. This production was a touring production by a long gone touring company called Cherub. Looking back it was probably one of the first things that made me think about directing. The play really sang in the most simple way. Also my dad was very interested in medieval history which he passed on to me and I am fascinated by that part of our national history. My partner comes from Scotland so I have spent quite a lot of time there, particularly on the east coast of Scotland where the play is set and I know Fife really well and a lot of the areas that Shakespeare talks about in Macbeth. In terms of the socio-political side of it there’s always a question about resonance; why do this play at this moment now? I think the play speaks very very keenly to a lot of aspects of the present. It’s a story of corrupted leadership and ambition survival. You don’t have to look very far in terms of what’s near at hand to see how ambition can change leaders. Once they start taking various courses of action we discover how that can lead to a corruption of them spiritually and literally. If you look a bit further afield to the Balkans a while ago, to Syria now, to The Congo or Libya, it is not hard to see contemporary parallels of what happens when you’ve got a long civil war and a kind of breakdown of any kind of order. In the beginning of the play it is one of the most successful marriages in Shakespeare. Macbeth and Lady Macbeth is a very strong union and that gets deconstructed and pulled apart because of the effects of leadership and its challenges. So in terms of how to do it you need to go back to the original. What Shakespeare is talking about is not 1606 London but the chronicles of Holinshed. Shakespeare referred to him constantly and Holinshed is writing about 11th Century Scotland. He writes about the times when the Viking invasions and the Norwegians were ravaging a lot of coasts of Scotland and the south of England. Trying to keep the kingdom together at that time would have been really difficult. I have seen various productions of the play where they have set it in the 20’s or even in the 16th Century and for me that becomes about rich people killing rich people. The ambition stakes obviously come through and the relationships become very strong. But there is something else in there which is true to the 11th Century origin of it which is crucially about survival. For people to get by – to even live – in an environment like that you have to be very quick and take opportunities when they come and sometimes that requires radical action. There is another big aspect of the play beyond the personal and the political and that is the metaphysical. 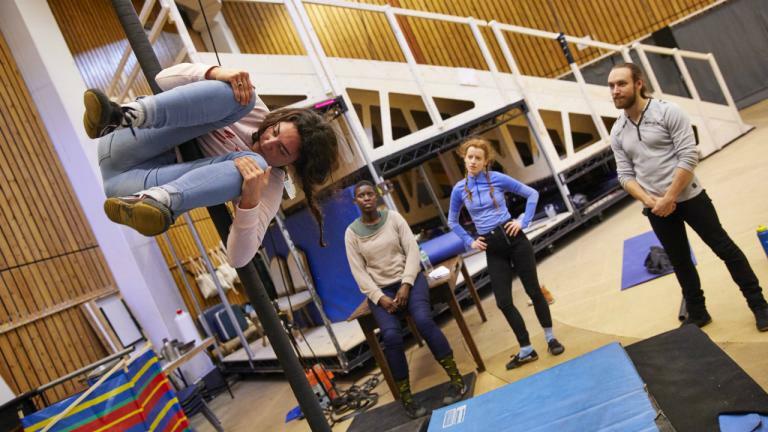 Actress learning to climb the pole creatively for original production of Macbeth at the Olivier. The witches are a huge part of it and it is interesting that when Macbeth writes to Lady Macbeth he doesn’t say “Bloody hell! I met some witches”, he says “I met the witches and they said this…”. So there is something quite normal about that level of superstition or other worldly goings on in that world. Again, if you look at conflict situations, superstition rises to the surface and people take whatever they can; lucky charms or belief systems. These belief systems come out of the environment to help them find a way through it. So I wanted to find a way of setting it which honoured that. Christianity has been pretty embedded and secure in Britain for a long time from the 14th Century onwards. We are probably more irreligious now than we have been in this country for maybe a thousand years but in that time, the 11th Century, the pagan beliefs systems that are underneath our Christianity would have been more prevalent. Rory Kinnear (Macbeth) in Macbeth by William Shakespeare @ Olivier, National Theatre. Directed by Rufus Norris. In terms of the artistic vision of this production of Macbeth the contemporary is an obvious place to go to. If you imagine that the national grid went down now and the lights went out and the internet went within five minutes then the banks stopped delivering money and the rubbish stopped being collected, in a week’s time our urban landscapes would look completely different. In a month’s time it would be unrecognisable. In a year’s time people would have adapted in whatever way the could. Well, the ones that had survived but it would probably look a lot more like 11th Century Scotland. So to set it in a post civil war in a contemporary way seemed to me a very resonant way of doing it. It also chimes with what we are all looking at on our phones and on newsfeeds and everything else. I travel quite a lot and whenever I have been to places that are very poor or law and order is not what it is here – the sight of plastic everywhere and the kind of ingenuity of invention and recycling is very interesting. One of the key things for most theatre makers, I think, is to find images early on that tell you something about the world you want to make. 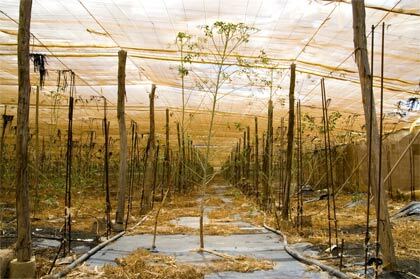 I was driving across Fuerteventura in the Canary Islands and we came across a greenhouse. Well, it had been a greenhouse about ten or fifteen years earlier. It was absolutely massive, so much so you couldn’t see the end of it. It was all tattered plastic and it looked like some sort of native Indian burial grounds. Completely spooky. I locked that image and feel in my brain for future use. Then moving into how we approached the production with Rae Smith our designer that image and a series of other images became key to be our landscape of Scotland. I wouldn’t describe it as post apocalyptic because I think Macbeth’s experience in our play is more civil war than apocalypse related. Beyond that you have then got to go back to the play. It goes from the heath, this epic landscape down to very intimate scenes. Macbeth is most famously done in very small theatres because it is often so intimate. In the key scenes between Macbeth and Lady Macbeth where the fates of the Macduffs are being discussed you have got to be able to iris right down into the intimate and then open out again. So those staging conditions then became a key part of trying to work out how to tell this story. One other thing that is really important is that we are a national theatre. Obviously the fearful part of my job as artistic director, that will get me fired, I guess, is if people won’t come. We want to make theatre that is good and that people want to see but beyond that and equally important is that we have to earn our title ‘national’. I think a lot of our national arts institutions have not paid enough attention to that and it is beholden on us and part of our duty and privilege as the National Theatre to be able to prioritise getting around the country. This is partly to get our work shown around the country but partly, and increasingly, to try and encourage and support our arts centres or theatres. Another aspect of that is that we are a very diverse nation and if you go to Glasgow or Edinburgh now you will see a diversity that is particular but not too dissimilar from many other cities in the UK. And so it is important to me that the production also reflects that. I think it is really key that the work we do is representational. Making the work national is very important so for this one it is a bit of a no-brainer that we should put our efforts into making sure we could tour it. We want to make sure our roots go a bit deeper in terms of our collaborations with the cities we visit and we will be addressing how important the creative industries are for this country. What’s always a challenge when you’ve got an element like the weird sisters in a play, which does go beyond human behaviour, is how far you try and find the root of their words in normal human behaviour. If you imagine a group of people who were once people and have adapted to survive and have the kind of wisdom that you associate with the ancient version of what witches might have been about- they could tell you stuff about yourself that seems impossible to know. Like modern day Derren Brown! My take on it is that in that in our past deep spiritual history, as in probably every community on the planet, we have had a very symbiotic deep relationship with nature, which we may have lost. The Green Man is, in a sense, the iconic British epitome of that. The Green Man is the forest and the spirit of nature and is ambivalent. So if you see a thorn bush and you need to get to the other side of the thorn bush you can run at it and fight it but it ain’t gonna go well. Or, you can respect it and to an extent the Green Man is a reflection. I think the witches are reflecting back onto Macbeth what they see in him. He is described by the witches as ‘Till he unseamed him from the nave to th’ chops and fixed his head upon our battlements’. In our production we do that as we open the play. So they can see in Macbeth, out of all these murderous, vengeful people that he is the most murderous and the most vengeful in this desecrated landscape. If they want that desecrated landscape to have any chance of revival they need to get to the bottom. I suppose my secret theory is that I see in Macbeth the man that can do that, who can take things so bad that things they will get better. They don’t know it so they offer him the opportunity. The idea then of a thane or a leader becoming king that is not unusual. This is a martial period where the strong man wins. In Scotland in that time you didn’t have the king naturally passing on his power to his son. That wasn’t how it went. It could go to his son or it could go to another thane. In act one scene four when Duncan virtually says “Well done Macbeth – you were brilliant, well done Banquo you were also brilliant. I now give my kingdom to Malcolm!” All we know about Malcolm is that he got captured in the fight. He isn’t a scrapper and all the thanes in that situation would now go “Oh no, we have just won the war and now he has done that and it just means its going to start again.” Duncan is already a weak king and to hand it over to his even weaker son isn’t a popular choice. This means there is now an environment where we can have some sympathy for Macbeth because he has just done all that work and now we are going to go all the way back to the beginning. The only thing to do here is to take control and the seed has been sown and the witches are holding up a mirror to that, taunting Macbeth to action. The witches have knowledge beyond just observation and we see more of this in the second half. 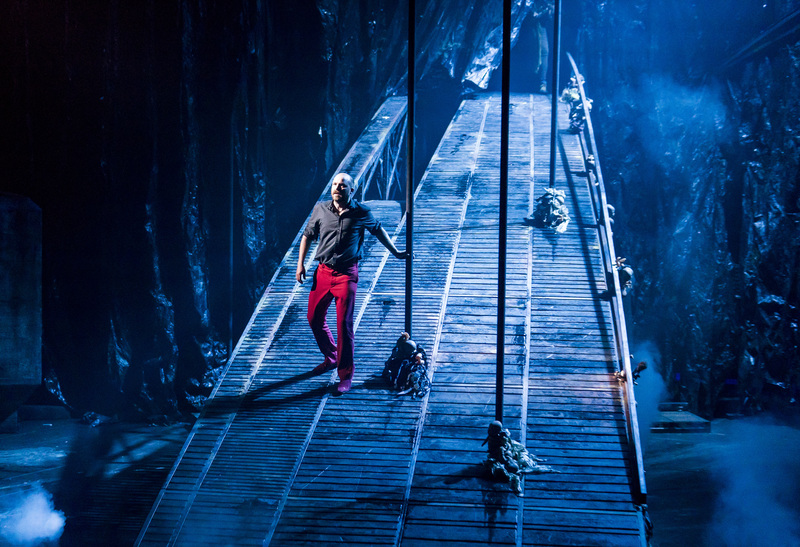 Asked what are the challenges about transferring Macbeth from the huge National Theatre stage to various stages around the country Rufus Norris answered. RN: Well I would say there are opportunities rather than challenges. It is really lovely to come back to a play again, not least because whatever you are doing in the rehearsal room; when you come to a theatre you’ve got a very short period of time to make that work. There are ways I think we can improve on the production. 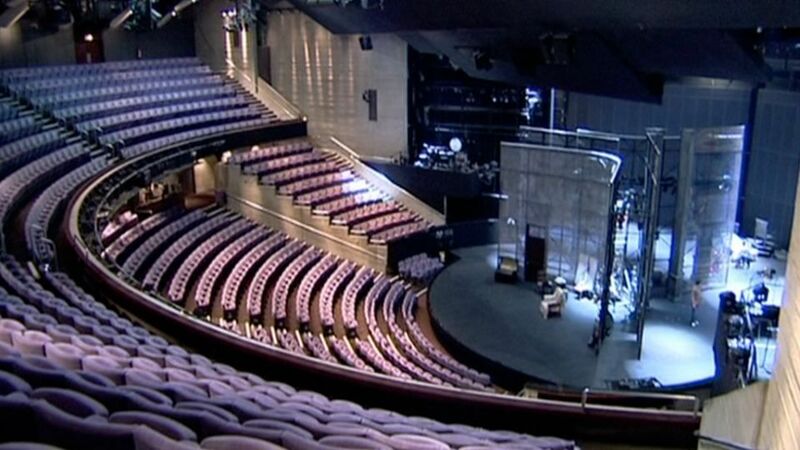 Also the Olivier, which is where we originally put it on, it is a very particular theatre. It’s particular because it’s Greek. It’s got a bit of a thrust to it but also everybody in the audience can see the floor. That might not seem important but what it does is, it gives it a real width which is great if you are doing the big wide scenes but if you are getting really intimate that’s quite tough. Once you move the show into the proscenium arch that becomes a lot more controllable. There’s a lot of directors I know who will only work proscenium arches a lot more because it is like a screen. So the opportunity of taking that production and putting it into the proscenium arch, I think, for the intimacy, will be really good. We have changed the design and aspects of it and we are developing the witches in fact. We are tying them into the environment much more to get a little closer to what I was just talking about. The supernatural in a natural place. The challenge in that is how you go from the National Theatre to Bath or other theatres that are much smaller. That means we have a composite set which means we can do version A or version B. Version A being the bigger one and version B being the slightly smaller. It’s the same show but the version B can slightly shrink to fit. With every venue you want it to be bespoke so the gang will come in and have a look round and adapt and space it out and make sure that it really fits the stage environment. One of the aspects of the play is that the Birnam Wood trees are stylised and they’re poles so we have trained the witches to climb them so that there is a sense of them having a place to escape to especially when the fighting starts. Also they have a place where they can look down on the action and it gives them a slightly other worldly feel. That training takes quite a long time and it also means that is a visual aspect of the show that we can enhance and we will go quite a lot further with this time. The idea of the Macbeths living in desperate times and having nothing so therefore have nothing to lose expresses itself in their ambitions of power. Is Lady Macbeth an excuse for Macbeth’s behaviour? Should we love and care about the principal characters even though they are evil? Anne Marie Duff (Lady Macbeth in the original National Theatre production) describes Macbeths as a Bonny and Clyde couple who are grieving and trying to find another state of futureness within. 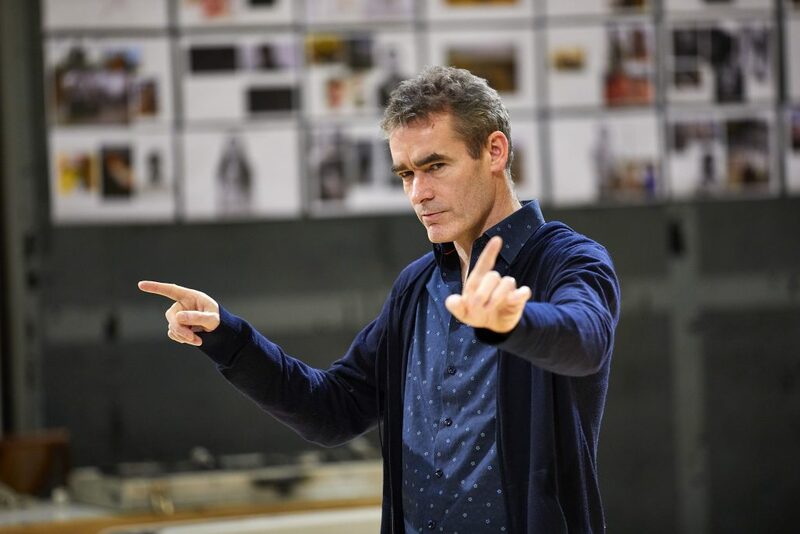 Phil Lowe chats to Rufus Norris about Lady Macbeth. 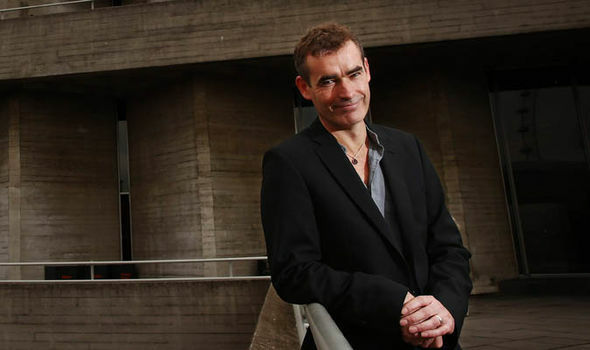 Rufus Norris says “I’d absolutely go along with Anne Marie. You don’t hire somebody like Anne Marie Duff if you want somebody to phone in a kind of two dimensional version of Lady Macbeth. Shakespeare is much much better than just painting this somebody who is just evil. For me it is a really fascinating tragic disintegration of a relationship. They both go mad in very different ways: Macbeth plagued by the ghost of what’s gone on and he, in quite a male way, thinks, well I’m going down this road so I am gonna go down it faster. She feels increasingly isolated because the one thing that she had which was the heart of this relationship, in very testing and difficult times, has fallen apart. Shakespeare doesn’t give precise information but we know from what they say that they have lost a child. Childlessness is a theme that runs all the way through it. When Macbeth says “To be thus is nothing. But to be safely thus…” and leads on to talk about Banquo. Here he’s massaging up a hatred of Banquo because Banquo has children. He kills Macduff’s wife and children because it is an immortality that he cannot have. By placing the play in this context we are suggesting that their childlessness is as a result of the warring situation. All she has is this relationship and whatever security they can get. As you say, they take desperate measures to secure a life. Then the play becomes about survival as well as ambition. Ambition is interesting up to a point but it’s like sitting back and watching a bad version of A Game Of Thrones rather than The Godfather which is much much more than ambition. It is about family and loyalty and trust and guilt. All of these other more subtle aspects that a master writer like Shakespeare is going to mine if the actor and the director and the team care to dig into it. Macbeth is really challenging in one respect because you don’t see that couple before that moment when they meet for the first time on stage with the line ‘Thy letters have transported me beyond this ignorant present, and I feel now the future in the instant’. So in a way they’re already there. You’ve not seen them together before. With Romeo and Juliet you’ve seen them before. It’s fifteen minutes before he meets Juliet. You really get a sense of who he is. Not so with Macbeth. He’s got one line before he meets the witches. But that doesn’t mean you can’t do the work that Anne Marie’s talking about in finding humanity in the character. 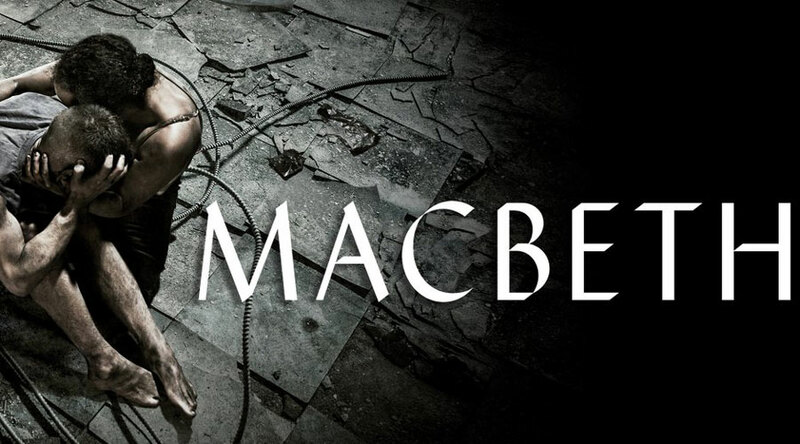 The National Theatre touring production of Macbeth comes to Theatre Royal Nottingham Tues 22 January – Sat 26 January 2019. Scottish actor Michael Nardone is to play Macbeth and Kirsty Besterman is Lady Macbeth. 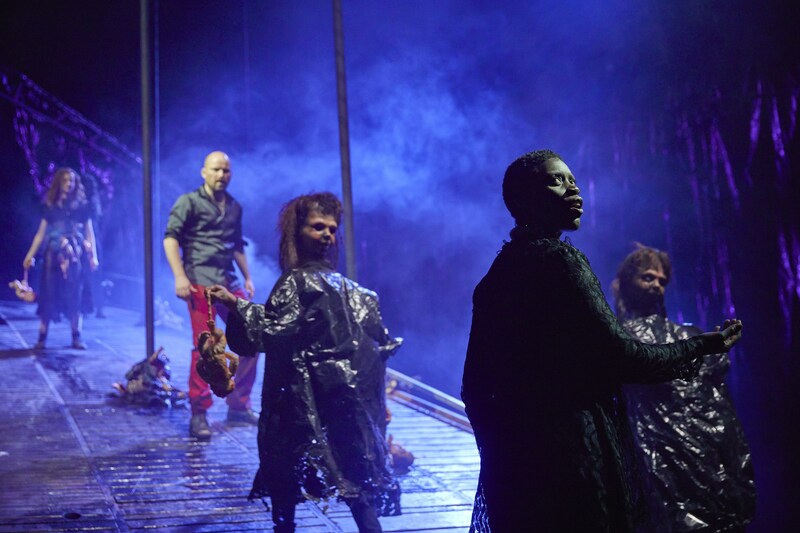 The National Theatre 18 venue UK and Ireland touring production of Macbeth runs from September 2018 – March 2019 opening at The Lowry Salford. Promo: Lovely video interview from two cast members of Curve Young Company and Community Fiddler On The Roof.